Here are a few shots we took the other day once the weather cleared up a bit. We’ll take some more shots of the exhaust once we have a more finalized version to show. Challenge – F30 335 / 328 Product Development Begins! 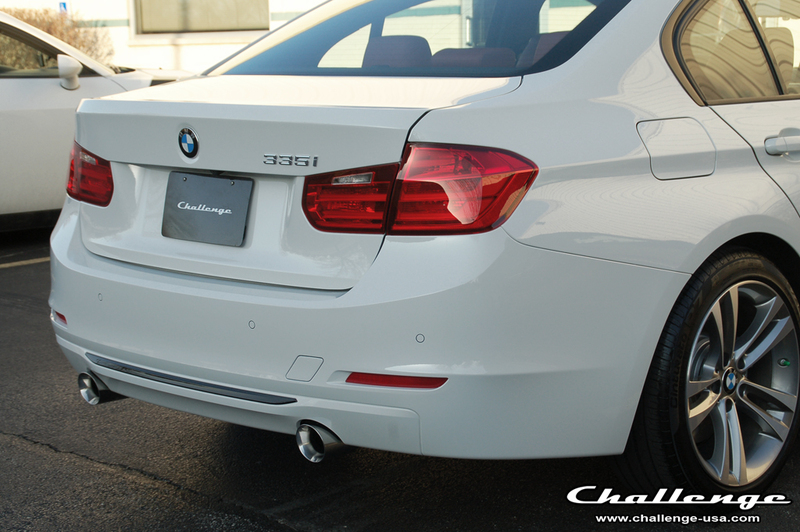 We bring you the first dyno results from a 2012 335i (F30) sedan, performed by Challenge Mfg. USA (GTM_Challenge) on their recently delivered 335i. The F30 335i is powered by the N55 6-cylinder TwinPower twinscroll turbo engine and its factory quoted power figures are 300hp / 300lb-ft. The 335i N55 dyno run resulted in 270whp and 273lb-ft torque. Note that the dyno was performed on a AWD Dynojet with linked AWD rollers. On a normal rear-roller-only system the numbers would be slightly higher (probably 5-10hp) given the less roller weight that would need to be moved. What does this translate to in terms of crank HP (for comparison to the factory quoted figures)? Taking 275whp and 278lb-ft as the starting point and assuming a 15% drivetrain loss, it would mean that this 335i outputted approximately 324hp / 327lb-ft torque at the crank (or +24hp / +27lb-ft over the factory quoted numbers). Like the F30 328i with its N20 engine (dyno results), it’s safe to say that the F30 335i and its N55 engine are also underrated from the factory (no surprise). Check out the dyno run video and graph below.